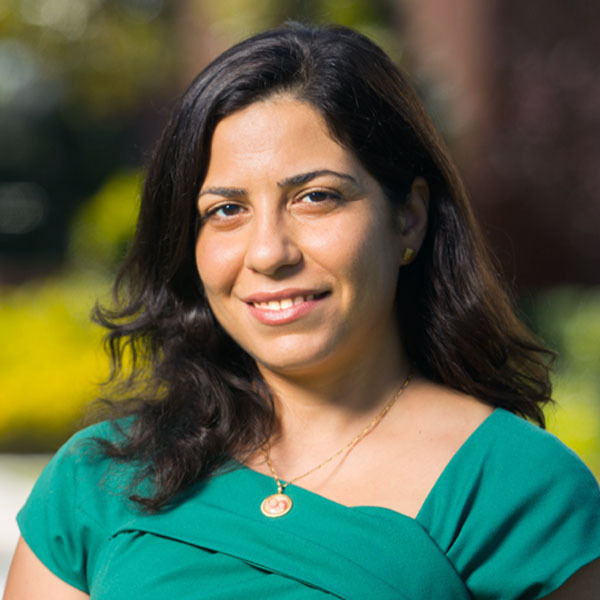 Tania Abouezzeddine has studied and has experience in several areas in the field of psychology working on topics such as trauma, pediatric psychology, cross-cultural psychology and clinical neuropsychology. She is currently an associate professor of psychology at Biola, previously at the University of Southern California. Abouezzeddine graduated from the American University of Beirut in Lebanon with a degree in psychology. She earned her master's degree at Boston University and later her doctorate in psychology specializing in clinical science at the University of Southern California. During her doctorate studies, Abouezzeddine studied the effects of social support from friends and family on adolescents consistently bullied in their school environment. In addition to her work in the area of school trauma, Abouezzeddine received extensive training in the area of clinical neuropsychology working with populations across the lifespan, from pediatrics to geriatrics. After earning her doctorate, Abouezzeddine completed a two-year postdoctoral fellowship at the University of California, Los Angeles, where she specialized in pediatric neuropsychology assessing children with traumatic brain injury, seizure disorders and learning and developmental disabilities. In addition to clinical and academic work, Abouezzeddine is heavily involved in ministry both within her community and internationally. She has been in a position of leadership in her local Bible Study Fellowship class since 2006 and currently holds the position of class administrator. She currently leads a children's Sunday school class at her home church and is involved with international holistic training with World Orphans. Schantz-Wilkins, S., Guzman-Clark, J., Osato, S., Harada, N., Henriques, D., Royer, C., Abouezzeddine, T., Castle, S., & Dhanani, S. (2011). Comparison of the GDS and the PHQ-9 Depression Screening Instruments in Ethnically Diverse Older Medical and Psychiatric Veteran Populations. Federal Practitioner, In Press. Yuan, H.C., Sohn, E.Y., Abouezzeddine, T., Mahrer, N.E., Barber, B.A., Keens, T.G., Davidson, W.S.L. & Gold, J.I. (2011). Neurocognitive Functioning in Children with Obstructive Sleep Apnea Syndrome: A Pilot Study of Positive Airway Pressure Therapy. Journal of Pediatric Nursing, In Press, Corrected Proof. Abou-ezzeddine, T., Schwartz, D., Chang, L., & Lee-Shin, Y. (2007). Positive peer relationships and risk for victimization in Chinese and Korean children's peer groups. Social Development, 16 (1), pp. 106-127. Toblin, R.L., Schwartz, D., Gorman, A. H., & Abou-ezzeddine, T. (2005). Social-cognitive and behavioral attributes of aggressive victims of bullying. Journal of Applied Developmental Psychology, 26(3), pp. 329-346. Schwartz, D., Toblin, R.L., Abou-ezzeddine, T., Tom, S., & Stevens, K.I. (2005). Difficult home environments and the development of aggressive victims of bullying. In K. Kendall-Tackett and S. Giacomoni. Victimization of children and youth: The spectrum of crimes against children. Schwartz, D., Hopmeyer Gorman, A., Toblin, R., & Abou-ezzeddine, T. (2003). Mutual antipathies in the peer group as a moderating factor in the association between community violence exposure and psychosocial maladjustment. In E.V.E. Hodges & N. A. Card (Eds. ), Enemies and the darker side of peer relations. New Directions in Child and Adolescent Development, 102, pp. 39-54. Yuan H.C., Sohn E., Gold J.I., Abou-ezzeddine T., Mahrer N.E., Azoff J., Keens T.G., Davidson S.L. The Effects of Positive Airway Pressure Therapy on Cognitive Function in Children with Obstructive Sleep Apnea Syndrome: Preliminary Findings. Paper submitted to The Associated Professional Sleep Societies, June 7-12, 2008. Hopmeyer-Gorman, A., Schwartz, D., Nakamoto, J., Abou-ezzeddine, T., and Toblin, R. (2003). Peer-perceived popularity, aggression, and trajectories of academic engagement in early adolescence. Paper symposium at Society for Research in Child Development, Tampa, FL. Abou-ezzeddine, T. & Yiyuan, X. (2003). Friendship as a moderator in the relation between social risk factors and victimization in Chinese children’s peer group. Poster-presentation at the Society for Research in Child Development, Tampa, FL. Arner, H.M., Abou-Ezzeddine, T., & Bollinger, A.R. (November 2000). Relationship between anger and PTSD symptomatology, social support, and locus of control in combat veterans. Poster presentation at the Association for the Advancement of Behavior Therapy, New Orleans, LA.